My readers will probably have noticed the near-lack of progressive metal reviews on my blog if compared to other blogs and sites. Indeed, even if I am a longtime fan of classic heavy metal, the cross-fertilization of the genre with progressive rock has always left me rather cold – with very few exceptions. On the other hand, I believe it is essential for a reviewer to be exposed to a variety of subgenres within the broader spectrum of prog, and to recognize quality even when a particular subgenre does not exactly set our world on fire. Like it or not, prog metal is here to stay, and its role in reviving a genre that is very much at risk of becoming stale or simply irrelevant – as well as drawing the younger generations to it – cannot be understated. Based in the historic Bavarian city of Nuremberg, five-piece Effloresce were formed in 2008 by guitarist/keyboardist Dave Mola and drummer Tobi Süß after the demise of their previous band, Falling Nature. After releasing an EP titled Shades of Fate in 2009, the band appeared at the first edition of the Generation Prog festival (it was their first gig with new bassist Sebastian Ott), and were subsequently signed by the new Generation Prog record label, founded by Relocator bassist Michael Schetter. Their full-length debut, Coma Ghosts – mixed and mastered by Dan Swanö (of Edge of Sanity fame) – was released in February 2012. They were also scheduled to appear at the 2012 edition of Fused Festival in the UK, but unfortunately the event was cancelled due to poor ticket sales. A couple of months after the album’s release, guitarist Tim Ivanic had to leave the band, but was promptly replaced by Chris Steingen. Female-fronted prog metal bands are a dime a dozen these days, and listeners might be forgiven for thinking that Effloresce are yet another outfit in the popular yet somewhat tired “Beauty and the Beast” vein. Now, while vocalist Nicki Weber (who also plays flute, and is responsible for all the lyrics) is definitely an attractive young woman, she can play both roles and deliver some mean death-metal growls to offset her clear, soaring tones. Though it would be easy to lump her with the ever-growing crowd of Tarja Turunen followers, her voice often suggests a folk background rather than an operatic one – especially when she tackles more subdued material such as the ballad-like “Swimming Through Deserts”. To be honest, I generally have little time for gothic/symphonic metal bands: however, I found Nicki’s singing genuinely pleasing to the ear, and could not help admiring her for engaging in one of the most controversial routines on the music scene, especially as far as prog is concerned. While her growling (very judiciously used) is not as ferocious as Arch Enemy’s Angela Gossow’s, it does add an unexpected edge to the band’s overall sound – which is undeniably heavy, but always melodic and tuneful. 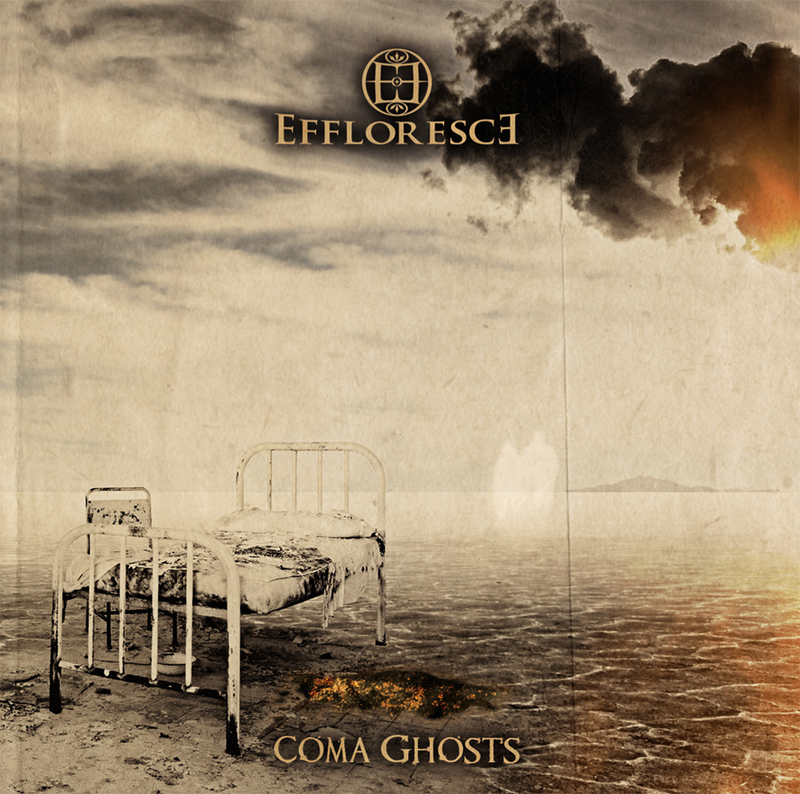 Though it is not easy for “traditional” prog metal acts to escape the all-powerful influence of Dream Theater, Effloresce manage to avoid the blatant plagiarism that dooms so many productions. They pay their dues to the New York titans mainly in the album’s opening track, “Crib”, where Dave Mola’s keyboards (including mellotron) play a more relevant role than in the rest of the album, while the catchy chorus anchors the song to the more accessible side of symphonic/progressive metal. However, the Opeth influence emerges in the 10-minute “Spectre Pt 1: Zorya’s Dawn”, whose heavy. Sabbathian opening flows into a tense, guitar-led section relieved by the ethereal tone of the vocals and the gentle note of Nicki’s flute; growls, riffs and fast drum beats keep the heaviness quotient going. Similarly, “Pavement Canvas” juxtaposes melodic guitar with harsh riffing and blast beats, with percussion adding a faint ethnic flavour. The short instrumental “Undercoat”, based on majestic keyboard washes overlaid with bell-like percussion and creaky guitar sounds, introduces the haunting “Swimming Through Deserts”, a melancholy piece inspired by Opeth’s Damnation album, with poignantly sweet vocals and lovely, mellow guitar work. The album is brought to a close by the epic-length “Shuteye Wanderer”, a remarkably cohesive, 16-minute piece that brings together the melodic and aggressive strains of the previous songs, spanning a range of such diverse influences as Opeth, Metallica, Porcupine Tree and Pink Floyd, and spotlighting Nicki’s versatility as a vocalist. Clocking in at about 54 minutes, Coma Ghosts goes against the current trend for long albums (particularly evident in the prog metal field), and its 6 tracks are tightly composed and quite filler-free. For a debut album from a young band, it definitely impresses, even if it is unlikely to convert those who are still on the fence as regards the progressive metal subgenre. Effloresce surely have enough talent to develop an even more personal style, and the potential to branch out and try something more challenging for their next recording effort. A special mention goes to the professional quality of the album’s packaging, with a comprehensive booklet including lyrics and outstanding artwork (by Nicki and guitarist Dave Mola) and photography.